Temperature mapping is the study of temperature distribution within a temperature controlled environment, such as industrial fridges, cool rooms, warehouses and receiving/loading bays. The mapping study identifies possible cold spots (or hot spots) and helps determine whether or not remedial actions are required. The mapping study also validates the area to ensure temperature sensitive products such as perishable food and pharmaceutical goods are stored well within their ideal temperature. Temperature mapping is often required as compliance to a quality management system. When a new temperature controlled facility is built, mapping has to be done before use, as part of an Installation Qualification (IQ) and Operation Qualification (OQ) process. For an established facility, mapping is advised to be done every 2-3 years. Without a mapping study, certain products may be exposed to temperature outside of their limit, causing safety concerns. For example, raw meat and seafood are notoriously known to cause food intoxication and food poisoning when stored above 5C. Likewise, pharmaceutical products such as vaccines are extremely temperature sensitive. A 15 minutes cold chain breach (exposure to temperature outside of 2C to 8C) will greatly reduce vaccine potency and if administered, the ineffective vaccine will predispose the “immunised” population to greater health risks. Hence, temperature mapping is crucial the storage of temperature sensitive products. The purpose of the Temperature Mapping Protocol is to ensure the mapping exercise can be carried out in the correct manner. It should be prepared, reviewed and approved by someone who has a thorough understanding of the exercise. The protocol should define all acronyms and technical terms and describe how the facility is to be mapped. It should also clearly define the scope, purpose and reason of carrying out the mapping exercise. Ideally two studies should be done in each area to observe the effect of seasonal variation. Here is a guide on how to conduct the temperature mapping process. Select the appropriate Electronic Temperature Loggers. It is advised to only use one type of logger for each study. The selected Electronic Temperature Loggers must have a NIST-traceable 3-point calibration completed and validated with error no more than ±0.5oC at each calibration point. One of the calibration points should be below the lower limit, one in the middle of the range and one above the higher limit. The logger should also have a programmable sampling period ranging from 1 minute to 15 minutes with sufficient memory to provide reliable time-temperature data. Designate a mapping team. Appointed members have to be adequately trained. They should have a good understanding of the exercise and are familiar with the Electronic Temperature Loggers programming. Visit the site to be mapped. Conduct a site survey of the facility to be mapped with length, width and height dimensions. The site drawing should be showing entry/exit, shelving, pallet racking and heating/cooling sources etc. Establish acceptance criteria. The acceptance criteria should be defined in the mapping protocol. In the case of cold chain management, the most common temperature ranges are 2oC to 8oC and 15oC to 25oC. Determine Electronic Temperature Loggers locations. Sufficient number of loggers is required so that the storage area can be properly characterised. Generally speaking, there should be one logger every 5-10 metres depending on the layout of the area. Shelving and direction of airflow should also be considered. The location of the EDLMs should coincide with where the temperature sensitive products are stored. Record Electronic Temperature Loggers locations. The description of the logger locations must be clear. It is a common practise to construct a diagram for location identification. Label and Program Electronic Temperature Loggers. Each logger should have its own ID number and serial number so that it can be traced back to its calibration certificate. Each device recording interval and time should all be the same; otherwise the time-correlated temperature data would be inconsistent. Fix the Electronic Temperature Loggers in position. Ensure the loggers locations are coincide with the recorded location. They should also be fixed to a location where they will not be damaged or displaced during the course of mapping. Conduct the Mapping Exercise. The recommended duration of the mapping studying is 7 to 10 consecutive days for warehouses and 24 hours to 72 hours for temperature controlled equipment. Download and Consolidate the Electronic Temperature Loggers Data. Collect the Electronic Temperature Loggers and download the time-temperature data to a computer system for analysis. The software has to comply with the regulatory requirements of 21 CFR part 11. Ideally the minimum and maximum temperatures would be within acceptance criteria. If there is a breach, then further investigation is needed to identify the cause. The mean temperature can be referred to either arithmetic mean temperature or kinetic mean temperature (MKT). Both mean temperatures are useful for determining temperature consistency. For data interpretation, evaluate the temperature distribution of the area and give details to why certain areas were colder or hotter. If the temperatures were reasonable and stayed within the acceptance criteria then no action is required. Conversely, if cold/hot spots were outside of the limit, then the report should include recommendations. The effect of temperature fluctuation can be minimised by altering: air flow, replacing old system to increase output, or simply "zone out" the area for storage of stock. Crucial components of temperature mapping. 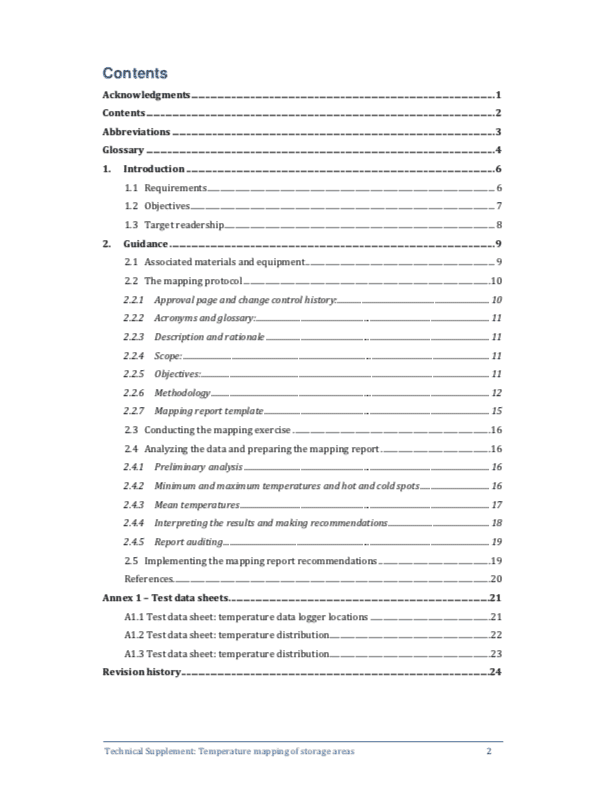 WHO technical report series No. 961, 2015. 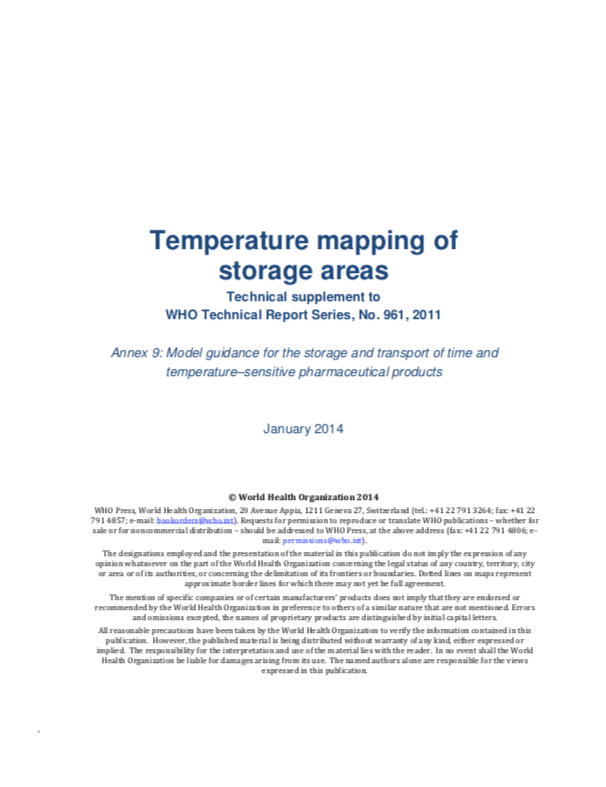 “Temperature Mapping of Storage Areas” technical supplement. CoolPac provides temperature mapping DIY kits and cold chain shipping solutions to the pharmaceutical industry.